Chris Brown finally apologized for his destructive behavior at "Good Morning America" -- but he made sure to take a few shots at the show at the same time. 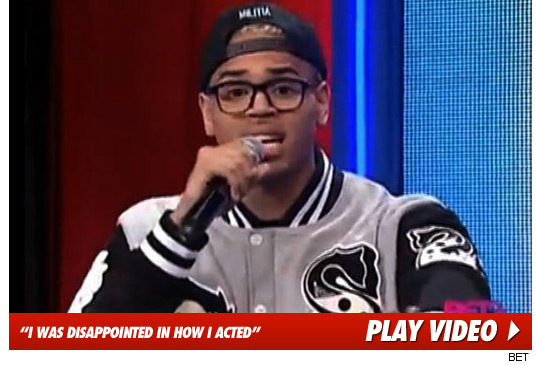 Though Robin Roberts says Brown was aware she was going to ask about Rihanna, Chris told a different story on last night's "106 & Park" on BET -- where he said the talking points approved by his people were all about "positivity" and his new album. Brown says he was "thrown off" by Robin's line of questioning -- and said she only brought up the Rihanna incident in an effort to "exploit me." The singer says he then exploded backstage "to release the anger that I had inside me," adding that "I got very emotional and I apologize for that." For their part, ABC News this morning said "Chris Brown was invited on 'Good Morning America' to perform and be interviewed. There were no talking points offered." On this morning's "GMA," Robin added "It's time to move on."